To weather the environmental changes of the northeastern climate, choose fruit trees that are cold hardy and disease resistant and, above all, proliferous in their fruit production. The best time of the year to plant fruit trees is in the spring--the ground warms up, the last frost has past and the fruit trees receive plenty of warm sunshine. Apple trees ("Malus spp.") grow well in the Northeast. Members of the Rosaceae, or rose, family, apple trees grow in the spring through summer seasons and reach heights as tall as 30 feet. Apple trees bloom in the springtime, followed by their fruit production in the summer through fall seasons. 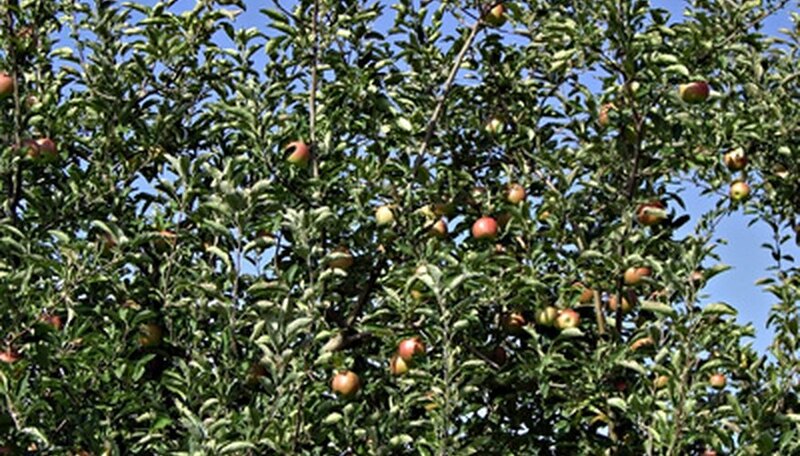 As stated by Cornell University's Cooperative Extension, some of the best apple trees for the Northeast include gala, freedom, empire, golden delicious and liberty varieties. Another fruit tree found in the Northeast is the apricot tree. Apricot ("Prunus armeniaca") belongs to the Rosaceae family, and it thrives in full sun and moist, well-drained soil. Apricot trees like warm weather, so select varieties that bloom in mid to late spring. Cornell University's Cooperative Extension lists harlayne, goldcot, harcot and harogen varieties as good choices for the Northeast climate. Cherry trees are either sweet ("Prunus avium") or sour ("Prunus cerasus"). These fruit trees grow in the spring through summer seasons. Their white blossoms bloom in the spring, followed by the formation of cherries that ripen in the summer. Cornell University's Cooperative Extension lists empire francis, hartland and stella as some sweet cherry varieties and balaton and montmorency as sour cherry varieties that grow in the Northeast. Peach trees (Prunus persica) and nectarines are two more fruits of the Rosaceae family that grow in the Northeast. These trees thrive in full sun and moist, well-drained soil. Plant new trees after the danger of frost has passed in the spring. Cornell's Cooperative Extension lists yellow peaches, such as madison and cresthaven, white peaches, such as eden and surecrop, yellow nectarines, such as mericrest and Pocohontas, and white nectarines, such as nectacrest and morton, as suitable varieties for the Northeastern climate. Pears ("Pyrus communis") also belong to the Rosaceae family and are suitable to grow in the Northeast. Pear trees grow from spring to summer and need full sun and moist, well-drained soil. White blossoms develop on the trees in the spring, followed by their fruits, which are ready to pick in the summer. Cornell's Cooperative Extension lists bosc, bartlett and gorham as varieties that thrive well in the Northeast. Plum trees ("Prunus spp.") grow in the spring through summer seasons and prefer full sun and moist soil. They bloom in the spring and form fruit in the summertime. Cornell's Cooperative Extension lists seneca, stanley, French damson and early golden as fruit tree choices for the Northeast.